I dig the idea of sitting down in the middle of the day to enjoy a good meal. It’s something I like to refer to, not surprisingly, as “lunching.” But, there is the idea of lunch and then there is the execution of lunching—and, for the latter, I’d encourage doing it Sea Salt-style. 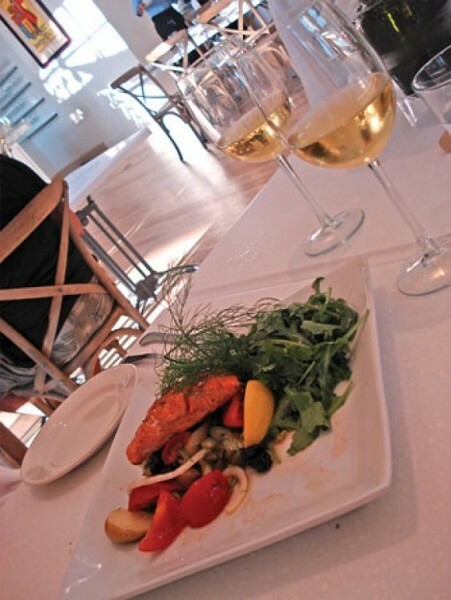 Sea Salt’s menu and atmosphere is inspired by the culinary landscape that is Italian cuisine. The décor is spacious and inviting, encouraging a more communal eating experience than many restaurants. It reminds one of the shared tables found in restaurants throughout the streets of Rome, or the tiny tables that fill up the piazzas of Siena. Though the lack of privacy might make some uncomfortable, I suggest making new friends through the mutual enjoyment of food. Sea Salt has an open kitchen with an imported Italian wood-fired oven that produces impeccably prepared Southern Italian-style pizzas. The simplicity of the Napoletana Margherita and its fresh buffalo mozzarella instantly won me over. Quality of ingredients is of utmost importance at Sea Salt—even the cans of fresh tomato sauce that line the back walls are the result of the tomato harvest from the chef’s garden. The eatery also boasts tempting pasta offerings, from gnocchi to risotto and even “Nona Maria’s” traditional meatball and ravioli recipes, straight from the heart of an Italian grandmother. The spaghetti carbonara incorporates an interesting twist: lemon zest and chili flakes, although it was prepared a tad more al dente than even the Italians would prepare it it. And if dessert beckons in the middle of day (and honestly, when doesn’t dessert beckon? ), then ordering the strawberry-rhubarb-buttermilk panna cotta with a dusting of pistachio is the way to go.